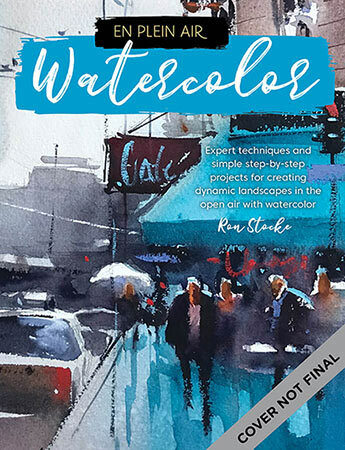 For artists looking to grow beyond the studio, Watercolor (En Plein Air) is the definitive resource for experiencing the rewards and invigoration of watercolor painting on location. Watercolor (En Plein Air) introduces beginning artists and fine-art enthusiasts to the core concepts of painting on location. This helpful guide will get you primed and ready for a day of painting outdoors. Inside, you'll find a comprehensive list of what to pack to maximize your time, learn how to choose a subject and interpret it for a composition, discover how to deal with the challenges of shadows and shifting natural light, and hone your techniques. The collection of step-by-step projects will help you reach new artistic plateaus as you create unique, dynamic artwork outside the studio. Perfect for artists looking to break outside the norm, Watercolor (En Plein Air) is the definitive resource for experiencing the peace and rewards of painting on location with the invigorating medium of watercolor.